Samsung out of stock of these so I checked with Mobile fun and they had it at a slightly cheaper price I think. Delivered quickly. As usual no fuss or problem. This wireless charger is so good. I'm so happy for it. Light weight not too big. Just love it. Looks nice and charges my S9+ just over 3hrs to 100% on normal wireless charging (Haven't tested fast wireless charging). My wireless chargers finishing on the pad edging was a little poor hence 1 less star. Excellent service & item does whst it should. I thought it folded down. This fast wireless charge pad this amazing, charges my Samsung S9 Plus very fast, i recommend this one if you looking for one. Just place your galaxy s9 plus on the charger and it will charge your phone. It will still charge the phone with a Samsung flip case on as well. The charger isn’t so big so it doesn’t take much room up wherever you want to set it up. You still have to connect the Samsung adapter that came with the phone. But once you’ve done that it’s easy. Red light shows while charging, which goes green for a full charge. Smart looking and has only a small indicator light which is fantastic so it does not disturb you sleep. Charges my galaxy s8+ really fast, bought this to charge my phone whilst using the usb-c port with with a HDMI converter works well no problems. Great service from mobile fun. GREAT CHARGER / LOOKS GREAT / SMALL & LIGHT / FAST CHARGE GREAT PRICE NO PROBLEMS VERY HAPPY CUSTEMER. Works really well, looks smart and is very handy being able to see the phone held at an angle whilst charging, rather than other wireless chargers that are flat. reassurance that it would work with my case or be able to get a refund. No problem because it does, and I don't. Just plug the power adapter to the pad and the wall once - from then on switch the power on, place the phone on the pad and take it off when the green light goes on. No more fiddling with cables. Probably the only time i am going to attach a cable again to the phone for power will be in an emergency for a quick recharge from a battery power bank. Excellent charger for the desk. Works as required. Fast charges as expected when coupled with a fast charger which is not included. The fan in the base works well when on the desk. Other than having to use a fast charger to power a fast wireless charger then the cost is for aesthetics since it only takes a second to plug the phone into the fast charger. Having a wireless charger is easy if use and shaved off a few secs at most to plug/unplug. 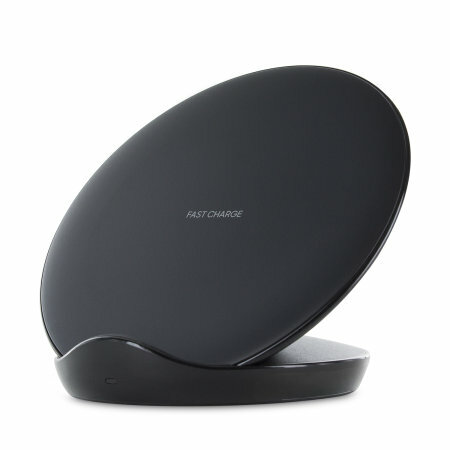 Official Fast Wireless Charger is One Stop Solution for Wireless Fast Charging. Its the Best available in Market. Far Better than other compatible wireless chargers. Highly Recommend this authentic solution for Galaxy Devices. Charges the S9 very quickly, about 40% to 100% in 1hr 30mins.